Hello and welcome to L-Wynd Ibizans! We live in Northwest Arkansas. Jason and I met our first Ibizan, Chewy, on the Fayetteville square in 2002 and that was the start of a long love affair with this exotic breed. Lwynd came to me in April of 2003 and I have been steadily adding to the family. These dogs are like potato chips… you can't have just one!! Lwynd, Amazon, Flutter, Breaker, and Caesar are our “kids” and their companionship and happiness always comes first. 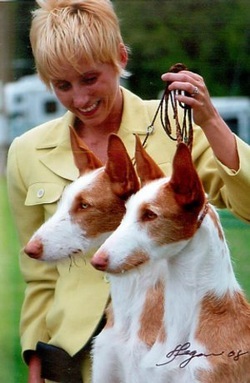 Besides their beauty, I enjoy the versatility of the breed. What I love the most about my Ibizans is that I can take them into the conformation ring and walk them right out to the lure coursing field or onto the boat to go swimming at “L-Wynd Island” on Beaver Lake. They also make great couch pillows or playmates for children. I started conformation showing when Lwynd was 9 months old and started lure coursing shortly after. I guess I could say Lwynd was my magic key; she opened the door to many amazing opportunities that most people only dream of accomplishing in the world of dogs! 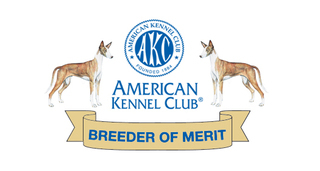 I have also had the pleasure of training and showing English Pointers and Keeshonds as well as a few other breeds. This is just a glimpse of how our dogs are a part of our life! Feel free to ask any questions that you might have about these stunning creatures and by all means stop in for a visit. We hope that you enjoy the site and keep returning to see future accomplishments here at L-Wynd!!! Inquiries and visits are always welcome!